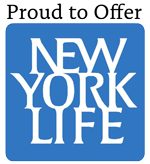 Matt Williams is a member agent of the Nautilus Group®, a service of New York Life Insurance Company. Through his membership, Williams Wealth Strategies collaborates with an in-house team of specialists in the areas of tax, law, life insurance, accounting, and charitable giving. Our planning process allows us to crystallize your goals and objectives; for family, business, and community legacy. We then work with a team of over 30 support staff based in Dallas, Texas, as well as your own advisors, to design a customized plan to meet your objectives. The Nautilus Group as well as its employees and Member Agents do not provide tax, legal or accounting advice. Eagle Strategies provides us with professional oversight of fee-based financial planning and investment advisory practices and access to investment management programs. Eagle Strategies LLC is registered with the Securities and Exchange Commission as an "Investment Adviser" and is an indirect, wholly-owned subsidiary of New York Life. Matt is an Investment Advisor Representatives (IAR) of Eagle Strategies LLC. *Based on revenue as reported by “Fortune 500 ranked within Industries, Insurance: Life, Health (Mutual),” Fortune magazine, 6/12/17. See Fortune 500 for methodology. ** Source: Third Party Ratings Reports as of 8/1/2017.